Our postdocs and students are vital to the continued growth of the Ostrom Workshop and represent the future of the Ostrom’s legacy. Angela Babb is a critical food geographer whose work examines the political economy of hunger and the contemporary food movement. Research projects include de/reconstructing the federal calculation of basic food needs and nutrition assistance; developing local and sustainable food procurement policies; mapping food access and emergency food networks; and identifying avenues for justice and sovereignty in regional and (inter)national food systems. Analena’s work is focused on sustainable agriculture and food systems with an emphasis on farmers’ participation in Alternative Food Networks and agricultural regulatory policy. Current research projects are focused on improving the economic viability and environmental sustainability of agriculture in Indiana through programs and tools including organic certification, conservation programs, and high tunnel technology. Analena will start a position as Assistant Professor of Food Systems in the Department of Agriculture, Nutrition, and Food Systems in the College of Life Sciences and Agriculture at the University of New Hampshire in the fall of 2019. Julia Valliant is a public health researcher focusing on learning from farmers and ranchers about how agricultural incentives can support them in building farm-level biodiversity and raising more nourishing food. Present projects address how farms and ranches continue, or transition, from one generation to the next; the food movement as a farmer-led health movement; grazing management for surface water point protection; and performance payments to reward grazers and farmers for ecological outcomes in agriculture. Kristina Anderson is a second-year doctoral student of Leisure Behavior in the School of Public Health. 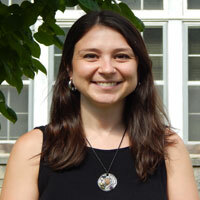 Her research interests focus on the intersection of outdoor recreation, human health, and pro-environmental behavior. Her overarching inquiry is to understand how individuals of diverse backgrounds develop relationships with the natural world, and what physical, mental, and social health outcomes result of those relationships. These research interests are rooted in a desire to address climate change, one of society’s greatest challenges, through influencing individual leisure and health behaviors. Guided by a belief that researchers should think critically about how research is communicated and shared, Kristina engages in science communication efforts for diverse audiences, across mediums. She holds a BS in Business and a BA in Economics from Indiana University and a MS in Natural Resources and a master’s certificate in Environmental Education from the University of Idaho. Ricardo Bello-Gomez is a third-year student in the PhD program in Public Affairs at IU’s School of Public and Environmental Affairs (SPEA). His research interests include public administration, multi-level governance and social service provision in the developing world. Ricardo is particularly interested in researching the performance of subnational governments in contexts of varying organizational capacity, diverse institutional frameworks and uneven distribution of state territorial reach. Ricardo holds a bachelor’s degree in Chemical Engineering from the Universidad Nacional de Colombia, and a specialist certificate in Economics for Engineering from the Escuela Colombiana de Ingeniería Julio Garavito. He also earned a Master of Public Affairs (MPA) with concentrations in policy analysis and international development from Indiana University. Tetiana Bulakh is a PhD candidate in the Department of Anthropology and Russian and East European Institute. Her research interests focus on forced migration, post-socialisttransformations, social rights, and humanitarianism. For her doctoral dissertation, Taniastudies the situation with internally displaced persons (IDPs) in Ukraine, inquiring into the state-citizenship negotiations, social welfare provision, and more generally exploringhumanitarian responses conflict-driven mobility. She earned her MA in Anthropology from IU as a Fulbright Scholar. Tania also worked as a communication director for the human rights documentary film festival and co-developed an educational initiative for displaced children in conflict-affected regions of Ukraine. Anthony DeMattee is a fifth-year doctoral student in the Joint PhD in Public Policy, withspecialities in public policy, comparative politics, and public & nonprofit management. Hestudies the politics and organizations of state-civil-society interactions in developing countriesand how they affect democratic processes and distributive politics, with a regional focus onAfrica and the Caribbean. Thanks to the generous support of the Ostrom Workshop and otherfunders, Anthony will spend the Fall 2018 semester in Kenya conducting dissertationfieldwork and collecting data from archives, interviews, and participant observation. He is aColorado native, Bloomington’s biggest Denver Broncos fan, and has ran marathons on fourcontinents. Cathryn Evangeline Johnson is a PhD candidate in the Department of Political Science at IU. Her dissertation research is supported by the Ostrom Workshop and an International Dissertation Research Fellowship from the Social Science Research Council. Cathryn’s primary research interests are in African politics, women’s political participation, and legacies of French colonialism. In her dissertation, Cathryn seeks to understand why women in the West African country of Burkina Faso participate more in local government than women in the neighboring country of Mali. Through immersive field research in two rural villages along the countries’ shared border, she finds that women’s associational participation is vibrant. In Burkina Faso, participation in associations helps women develop the capacity and efficacy needed to make claims on local government as women and as agricultural producers, while in Mali participation in associations leads to the development of capacity and efficacy that women deploy to engage in commerce. Cathryn traces variation in women’s local government participation to long-standing trends in how citizens in each country participate in politics and engage with the state. She finds that these different patterns began to develop during the late colonial period in the final decades of French colonial rule. Before beginning her studies at IU, Cathryn worked for the National Democratic Institute for International Affairs where she supported programs to strengthen democratic institutions and promote political participation in West Africa. Connor Stangler is a third-year PhD student in American History. His research interests include the instruments and infrastructure of American public policy in the mid-twentieth century. Currently, he is studying how public policy experiments and new bureaucratic instruments in the 1960s and 1970s changed how Americans thought about approaches to poverty policy and a universal basic income. Samantha von Ende (MA, Bioethics; BS, Biopsychology) is currently enrolled in a dual JD/PhD program through the Center for Constitutional Democracy (CCD) at IU’s Maurer School of Law. As a part of her dual degree program, Sam serves as a Fellow at the CCD, where she works as a research consultant for the Center’s political and legal sector reform work in Myanmar, Lao PDR, and the Hashemite Kingdom of Jordan. Broadly, Sam’s scholarship concentrates on varieties of constitutionalism, pluralism, and ethnic democracy in the MENA and Southeast Asian regions. Her research agenda explores the effects of constitutional structure and processes and the institutional and procedural design ethics that best inform durable models. Sam has published her work in several law journals, presented her research at several panels, and been invited to conferences hosted by the University of Berkeley, the University of Chicago, Australia National University, the University of Iceland, Indiana University, and the People’s Supreme Court of Lao PDR, among others. During her tenure at the Law School, Sam has served as the pPesident of the school’s American Constitution Society Chapter, as the CCD’s Executive J.D. Affiliate, and as the Executive Articles Editor of the Indiana Journal of Law and Social Equality. She has also played a role in teaching three introductory law courses; worked in a variety of roles as a research, teaching, and graduate assistant; and interned as a legal clerk in the Chambers of Judge David Hamilton of the United States Court of Appeals for the Seventh Circuit. Zhi Wang is a third-year doctoral student in the Department of Applied Health Sciences and a second-year Data Science student. His research focuses on substance misuse and the opioid epidemic. In particular, the field where he is most interested in includes the non-medical use of prescription drugs, opioids overdose, prescription drug monitoring programs (PDMPs), and healthcare utilization. He studies prescription drug misuse incorporating methods from public health, policy, data science, and machine learning. Zhi holds a BA in Public Administration from Southwest Jiaotong University and a Master of Public Administration (survey methods concentration) from the University of Illinois at Chicago.